This study, first published in 1983, explores the connections between Marx’s philosophy and his empirical analysis of society and state, by showing the different meanings of many of Marx’s concepts as their role in his theory changes and the theory itself develops. Beginning with an examination of Marx’s search for a sound epistemological basis on which to build a social theory, Dr Barbalet then gives an analysis of the way in which Marx continually modifies the concepts he uses, and continues with an examination of the different functions they are given in different theoretical settings. 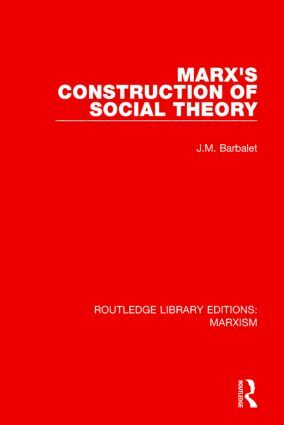 Various nuances of Marx’s thought, often obscured by the simplistic ‘early-late’ dichotomy, are revealed by Dr Barbalet’s close attention to the progressive transformation of Marx’s concepts and by his scrupulous analysis of them in not only their textual but also their theoretical context. Finally, the book examines the manner in which Marx’s construction of social theory, by its very nature, means that some material is replaced by other theoretical fabric as the theoretical structure itself is in different ways dismantled and reorganised, as Marx’s thought evolves and develops.